I have always loved scent and perfume, and have been experimenting with it for nearly ten years. I think natural, single-note scents are always a good place to start if you’re new to wearing a scent. Even if you’re a veteran to perfume, there’s still a time and place for trying new areas of the fragrance world. This post is dedicated to the company’s perfume and soap section, as I have not tried their line of beauty products. To read the founder's story, click here. The fragrances are divided into families, like fruits, florals, herbs and spices, and woods and resins. The scents are also very natural and light, only comprising of a single fragrance. This makes the scents easy for candles and soaps as well as perfumes. I first tried Pacifica’s rollerball and solid perfumes at least five years ago. I purchased the Waikiki Pikake and Egyptian Bergamot Rose in solid perfume and Persian Rose in rollerball. The scent Waikiki Pikake is a light sandalwood and jasmine fragrance, inspired by the Hawaii Islands (and like the other scents, has a lovely story surrounding the inspiration included). 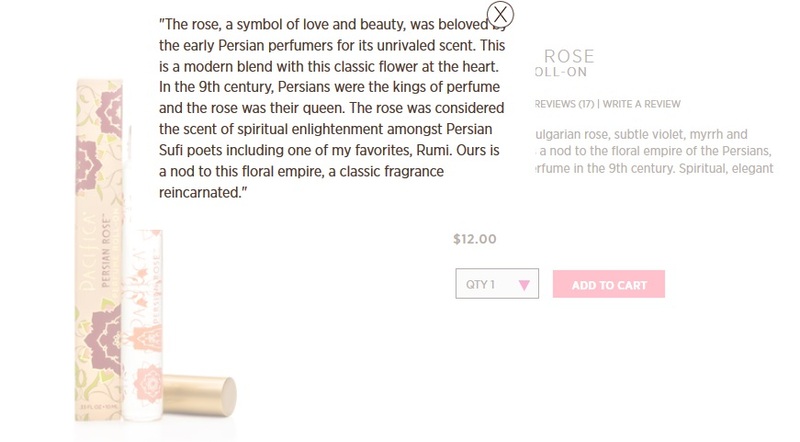 Persian Rose is a muskier rose scent, with notes inspired by the original perfumers: the ancient Persians and their yellow rose with one row of petals. 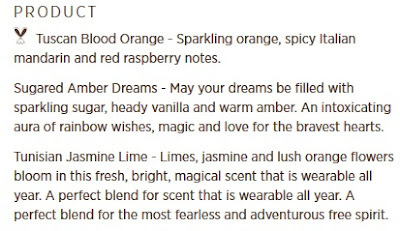 Unfortunately the Egyptian Bergamot Rose does not appear to be available anymore, which means I can't even contemplate finishing up that wonderful warm, earl grey tea-like scent. 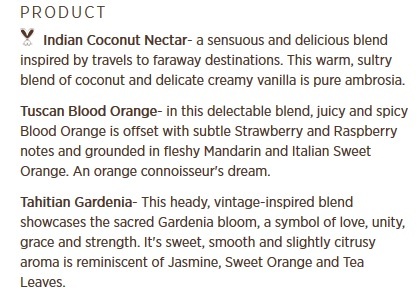 As you can see, I prefer warm, floral scents, and have not tried the fruity ones. Including my mom's purchases, I have gotten Waikiki Pikake, Persian Rose, Egyptian Bergamot Rose (RIP), Tahitian Gardenia, and Mediterranean Fig for perfume, and Tibetan Mountain and Persian Rose (yes, I love it!) for soap. I have purchased Christmas (yes, this is a super late post, I know) presents for friends and family featuring other fragrance families though, and will update if they care to share their opinions other scents. 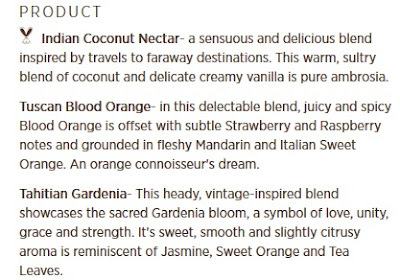 (I purchased two perfume rollerball trios, with Tuscan Blood Orange, Tunisian Jasmine Lime, Tahitian Gardenia, Indian Coconut Nectar, and Sugared Amber Dreams, as well as the Tibetan Mountain soap.) 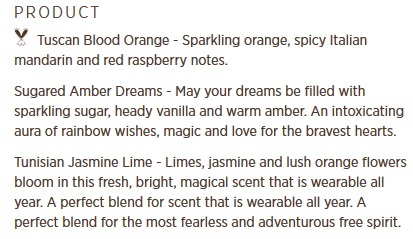 Below are the descriptions of the rollerball trios in "Dreaming", then "Enchanted". In case the perfume is not your thing, there are also soaps, candles, and reed diffusers available. My mom likes scented soaps because they do not leave too much scent in case others are sensitive (her workplace is at a school, so there are lots of people who could be potentially allergic to scents). She has tried several of the soaps, and they have great scent payoff as well, but are of course much lighter. I love perfume, and that is what originally drew me into trying Pacifica years ago. They only sent one catalogue, which is unfortunate, because having pages of picturesque descriptions of where the scents originate helps more people choose to try the company’s products. (I love getting my tea and flower catalogues, as it helps narrow down showcased items that might otherwise get lost on a website.) I plan on trying more soaps and other fragrances in the future, and am happy with my previous finds within the company. Oh, yeah, and the last purchase I made came complete with an amazing box I now use to keep miscellaneous soaps in. Who else is passionate about perfume and its history and origins? 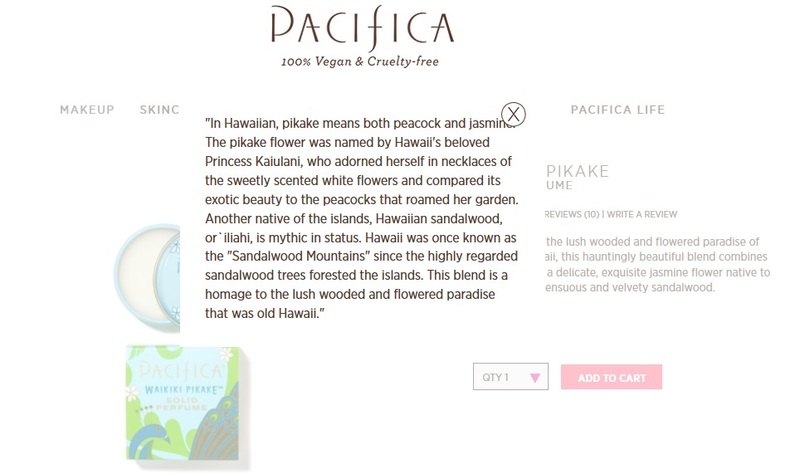 You can find out about the different scents and their histories on Pacifica as well as other books and sources online. Enjoy! Depending on what texture I wish my hair to have for the three days after washing, I will either get it as curly as I can, and preserve the curls, or brush it out after washing it, while it is damp, and this will make my hair much smoother by comparison. 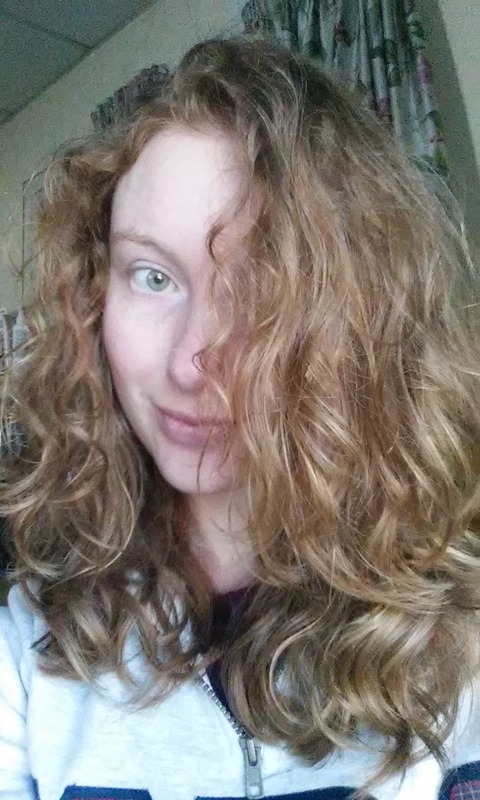 I understand the issue curly girls have with brushing hair, and I totally get you! Treat your hair specifically to the type. Mine is really between two different textures, so I feel like I can play with curly and wavy, but can't get it naturally straight or super curly. My friend with very tight ringlets cannot ever brush her hair, and only combs with a wide-toothed comb while it's soaking wet, so as not to disrupt the curl pattern (and create unnecessary frizz). 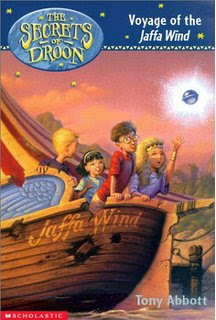 Growing up, my favorite hair idol was a character from a children's series called The Secrets of Droon. The character, Princess Keeah (the one on the far right of the ship), has to-die-for curly hair, kind of like AnnaLynne McCord. How she never messed up her hair on her 40-something adventures is beyond me, hahaha! I wash at night now because most days I have to leave pretty early in the morning, and I don’t know about anyone else, but showers actually make me sleepier. So the night before I use my OGX shampoo and conditioner, or my Aussie deep conditioner, letting whichever condish sit in my ends for at least five minutes. I then squeeze out my hair, then dry with an old t-shirt (towels cause frizz! ), and apply the next products on mostly wet hair. I use Cantu’s leave-in conditioner, comb it through, then apply Cantu’s curl activator, and comb it through. If I want light curls, I then scrunch at this point with my t-shirt, upside-down. I then let air dry as much as possible before using a scrunchie to put my hair in a loose bun on the top of my head. I do my version of pineappling (The pineapple method shown here.) for girls with longer, less curly hair. I simply put my hair in a loose bun on the top of my head and preferably sleep on a smooth, satin pillowcase. The night before day 3 I have to use dry shampoo, which I spray in, and ignore any white cast, as it will disappear as I sleep on it for day 3. I usually have to put my hair up, but sometimes my curls can become night loose waves for this day and I can have a few down-options. On wash night, I shampoo and condition as usual. I then comb through the Cantu leave-in conditioner, and let my hair totally air dry with NO scrunching. I brush through my hair in the morning, either with my wooden bristle brush or tangle-teezer, and add a little water in a spray bottle if it lacks texture. I love Aussie's Hair Insurance Leave-in Conditioner spray, and have been using it before brushing in the mornings for YEARS! I pretty much do the same routine for the next couple of days. 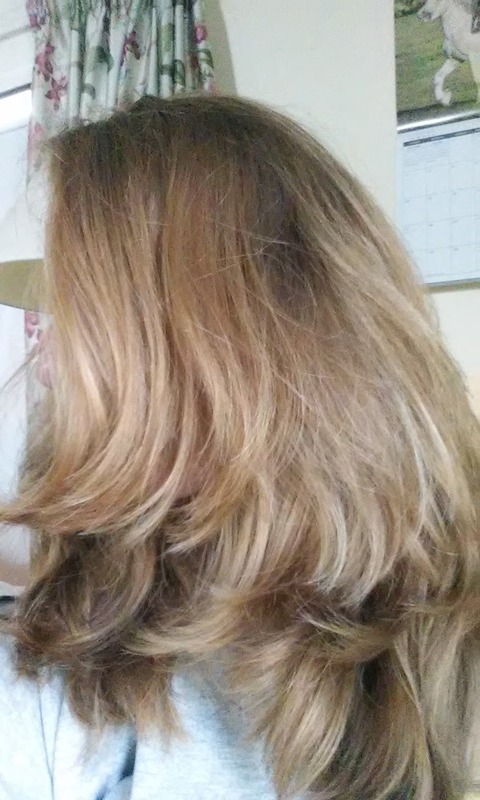 I use more water, or my Garnier Beach Chic Spray if I want more texture in my loose waves from my smoother routine. Now I mentioned in the first edition of my “Show of the Month” series last month that I would be doing a review/rant on the new adaptation of Winston Graham’s Poldark series, starring Aiden Turner as Ross Poldark. In all seriousness, I do watch more than one series in a month, and Merlin and Death in Paradise could have been contenders as well, but I LOVE Poldark, and as March is my birthday month, I thought I’d go for something I think will be special to me for years to come. 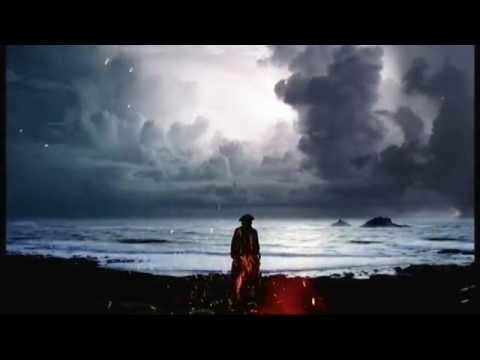 Poldark is based on a good dozen or more books by the great British author Winston Graham, back in the 1940s and 1950s, and the first adaption to television was made in the 1970s, and my mom definitely remembers her parents watching that, as they watched the good old period dramas of the 70s, like Upstairs, Downstairs as well. I have not seen the older Poldark version, and while I adore Upstairs, Downstairs (I just got the whole extended series for my birthday, as it is no longer on Amazon Prime for free! ), the 70s Poldark doesn’t seem as wonderful as the newer one. The synopsis without giving away the turning points of the plot is as follows. Ross Poldark, a young man from Cornwall who was sent to fight in the Revolutionary War to quell his gambling bets, returns home in 1782, to find his father has died months before, and his remaining servants languishing in the desolate house. He sets to work reviving his home, hiring a couple of villagers and a girl he rescues (and her dog from a dogfight) from her father to work in the home and the fields. Ross’s uncle is the heir of the Poldark family, so his own father received a small share in the land and family mining business, which he will now attempt to scavenge from ruin. Among the first things Ross Poldark does upon his return is to find a welcome from his remaining family, on his uncle’s side, his uncle, great-aunt Agatha, and cousins, Francis and Verity. 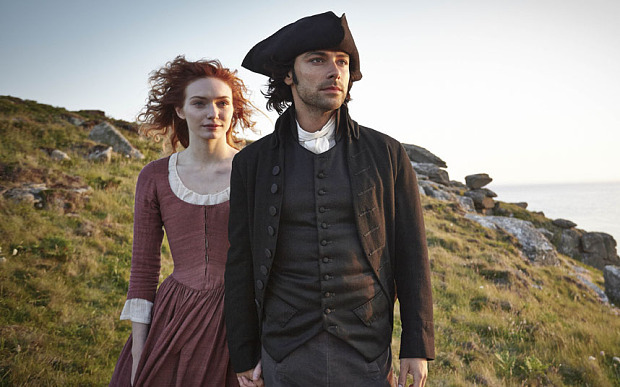 This visit marks a decline on his part, because he learns his betrothed, Elizabeth is engaged to his cousin and Poldark family heir, Francis, because of Ross’s long and uncertain time spent at war. Ross then pulls his energy into not gambling at cards, as before the war, but at bringing his farm and mines back to life. The first series is set with many grievances and joys. Ross is a commendable character, as well as Verity, Demelza, Zachy Taylor, and many others. The few “villains” are not truly evil, but just caught between honor and their personal greed. Even the honorable characters go through testing times and make difficult, if poor choices. This makes the series have a good taste of human fault and foible, which is only natural. The music, by Anne Dudley, is fantastic, as is the costuming. I’ve heard negativity, but only from someone I know who works as a historical role-player at an American colonial museum. 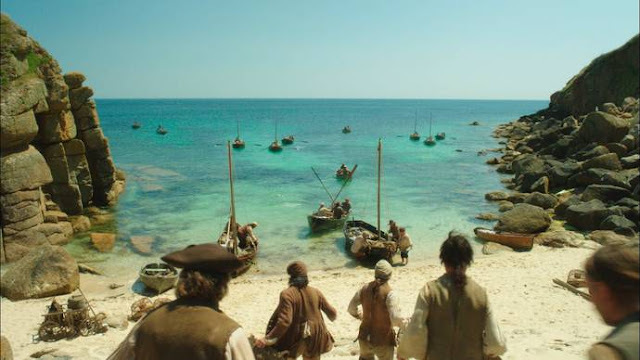 I personally don’t find the series lacking in historical accuracy, and it is certainly well-based on the books I have so far read by Mr. Graham, who as I understand, did intricate research of his own of the mining lives of Cornwall in the 1780s. 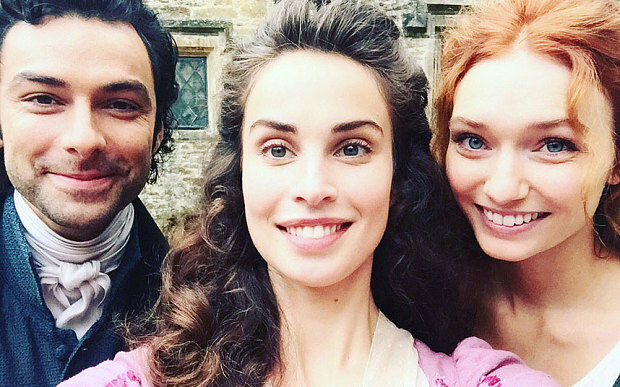 I thoroughly recommend Poldark, and cannot wait for the next season to come out, hopefully this summer! 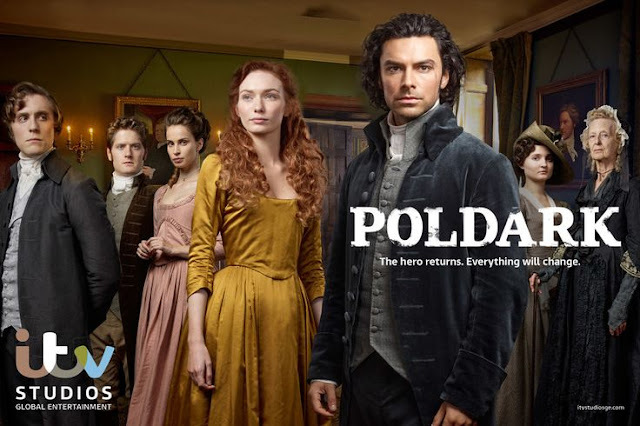 Poldark is not currently on Netflix, but can be found on Amazon Instant Video. In a large bowl, dissolve yeast in water. Stir in salt, sugar, oil, and eggs. Gradually beat in about 4 ½ cups of the flour to make a stiff dough. Turn dough out onto a floured board and knead until smooth and satiny (5 to 20 minutes, or 10 minutes in a kitchen aid mixer with dough hook), adding flour as needed to prevent sticking. Place dough in a greased bowl; turn over to grease top. Cover and let rise in a warm place until doubled (about 2-3 hours, adapted from 1 ½ hours). Punch dough down; knead briefly on floured board to release air. Set aside about ¾ cup dough and cover it. Divide remaining dough into 4 equal portions; roll each between your hands to form a strand about 20 inches long. Place the 4 strands length-wise on a large greased baking sheet (at least 14 by 17 inches, or put two sheets together, overlapping ends and wrapping the overlap with foil). Pinch tops together, and braid as follows: pick up strand on right, bring it over next one, under the third, and over the fourth. Repeat, always starting with strand on the right, until braid is complete. Pinch ends together and tuck under loaf. Roll reserved dough into a strand about 15 inches long, cut into 3 pieces, and make a small 3-strand braid. Layer on top center of large braid. Cover and let rise in a warm place until almost doubled, 2-3 hours (adapted from 1 hour). Using a pastry brush or your fingers, spread egg yolk mixture evenly over braids; sprinkle with seeds. Bake in a preheated oven for 30-35 minutes or until loaf is golden brown. Let cool on rack. This recipe makes one loaf. We heated the oil and water to about 130°, then added the oil and water the dry ingredients, including the rapid rise yeast. We then added the two lightly beaten eggs and the rest of the mixing was normal. The bread dough normally rises twice, but this time the first time was (as per the directions on the yeast package), for only resting (not rising) 10 minutes in the greased bowl. The second rise, which is when the braids rest for 2-3 hours, was normal. It turned out fine, if a slightly less risen, and more dense. That was the fault of us not using the proper yeast. So it worked to save time, but will not make the best possible Challah bread! We used it with butter and honey last night and for French toast this morning, and it was pretty good. I definitely recommend good regular yeast though! Adapted from the Sunset Breads, copyright 1984, fourth edition. I am a historical and pre-European contact field archaeologist who also has passions for history, physical anthropology, and geology. I love cats, most music, cooking, fashion, and all sorts of historical eras.